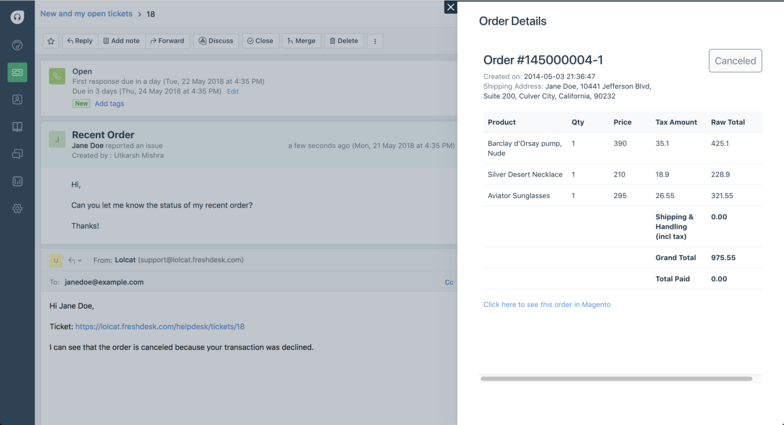 This Magento 1.x app makes customer support easier by giving you the ability to view your customer's personal and order information from Magento even before you start typing a reply to your customer. After you install the app, you should see a Magento widget right inside your ticket detail page. The widget gives you a brief information about your customer's most recent orders such as the order ID, total paid, status and the order date, along with the customer's information on Magento. 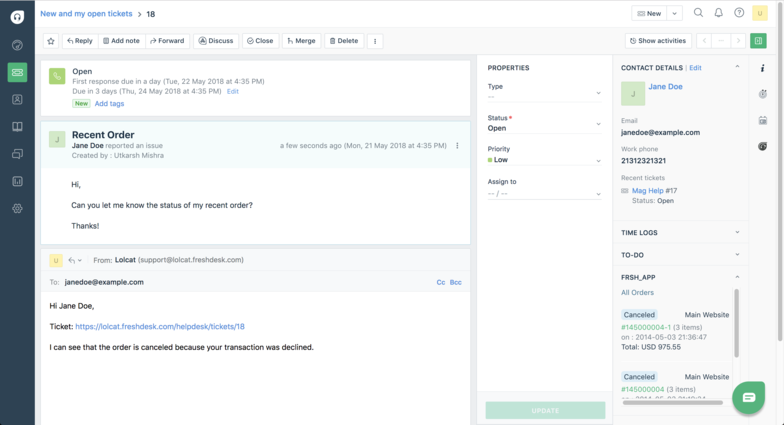 Should you need more information about an order, clicking on an order ID will render order information as a popup right inside your ticket window. You still have a link to view extended order information on your Magento store. Before you start configuring your new application on Freshdesk, you should be installing and configuring Freshdesk's extension on your Magento store. - Using FTP or SSH access, extract the contents of the directory into your Magento root directory. The directory has folders like app, var, lib, etc. - Clear the Magento cache: Log in to Magento admin and navigate to System > Cache Management. Click on Flush Magento Cache. - Clear Freshdesk extension cache: Navigate to System > Cache Management, select 'Freshdesk' from the cache table and under the 'Actions' drop-down (top right in the table header), select 'Enable' and press submit.